Il Castello di Vincigliata - FLORENCE LIVE! 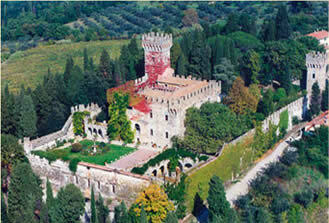 In 1885 John Temple Leader purchased the medieval castle of Vincigliata and spent twelve years redesigning it in accordance with the "Gothic revival" style popular at the time. However, a number of original crests can still be seen in the courtyard, and a fine fresco cycle dating back to the 14th century also survived the renovation work. The 19th-century scheme was not limited to the restoration of the building but also included its surroundings: the slopes of the hill were planted with trees and dense undergrowth suited to the rocky terrain. Cypress trees were also introduced here and there, in amongst the pines and holm-oaks, creating an unusual mix of conifers and deciduous trees. Leader was assisted in his landscaping scheme by the architect Giuseppe Fancelli and hydraulics expert Alessandro Papini. In the second half of the 19th century, Temple Leader purchased the ancient "Cava delle Colonne", a quarry whose name is a reference to the fact that the stone used to make the columns of the Princes' Chapel in the church of San Lorenzo came from here. This natural basin, which was transformed into a lake-like pool using water from the Mensola river, is the most conspicuous feature of the large romantic park. On one side of this lake the shoreline takes the form of craggy rocks that create beautiful caves, on the other an embankment was built. The waters are overhung by the surrounding greenery and the surface is adorned with aquatic plants such as water lilies, iris, papyrus and rushes. All the buildings in the park were constructed before 1883, with the exception of the Gothic-style tower (1885-1886), the visual focal point of this charmingly atmospheric bathing area. The tower, topped by a protruding walkway with Guelph-style crenellations, is very similar to the one on the castle's watch tower. The ladies' changing cabin, a Swiss chalet-style pile construction built over the water, is the only feature that has been lost. The so-called Maria Luisa Bridge connects the two sides of the river, beyond which stands the Kaffeehause with an elegant loggia.